The iron magnesite coin-shaped beads in this bracelet are a deep blue-green colour with splashes of mustard gold and swirls of darker earth tones. The beads measure about 7/8" in diameter. 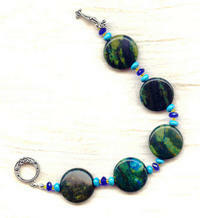 I've added roundels of chalk turquoise and cobalt blue faceted glass to make a bracelet that's approximately 8" long. It closes with a silver tone pewter toggle clasp. It's another big, beautiful bracelet from SPARKLE PLENTY. Like the dark shadows in the rainforest, kambaba jasper is full of mysterious swirls of black, grey and dark green.